Nashik is an ancient city located in the north-western region of the state of Maharashtra. This is the third largest city in Maharashtra after Mumbai and Pune. It is known generally as a holy city for Hindus in India because there are many temples and holy places. Nashik has become the center of attraction because of the wonderful surroundings cool and charming atmosphere. There are a large number of educational institutions that provide higher education in the field of medicine, engineering, technology, architecture, and pharmacy. Literacy Nashik rate is 80.96%. 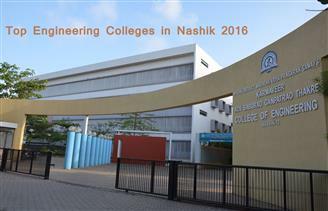 Here, we will list the top engineering colleges in Nashik in 2016. We have tried our level best to cover maximum colleges providing and will keep trying to do so. The best Engineering institutes in Nashik are covered here. If any Engineering institute in Nashik is missing in this list, kindly inform us using our Contact Form. Students studying in Engineering colleges in Nashik can also write reviews and feedback about their Institutes so that it will be guiding torch for other students. In this page you wil get information regarding, fees strcuture, admission processs, placement details, Hostels fees, and other campus facilities of Engineering Colleges of Nashik.